How Much Toe Room Should There Be In Dress Shoes? If you’ve shopped for shoes before, you probably know which of the more common types of shoes fit you best. Shoes like sandals and sneakers aren’t hard to figure out. Often times, all you need to know is your size and you’re good to go! These kinds of shoes can often have more wiggle room as well. The same isn’t necessarily true for dress shoes, as they can be made of less-forgiving materials. Because of that, you’ll need to be more careful about the shopping process. 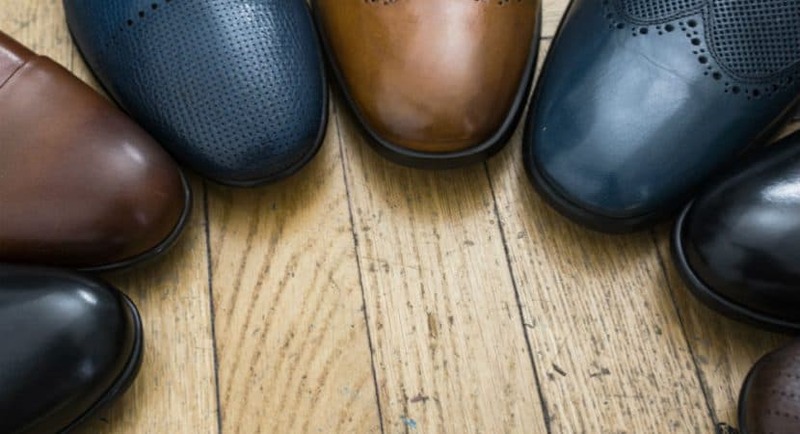 In order to help you know what you’ll need and what to expect, we’re here with some information on how should dress shoes fit. Just like when you shop for any other kind of shoe, it’s good to have an idea of your shoe size. This can help you and any sales person who helps you to at least be in the ballpark for what the best fit might be. Different brands are likely to have slightly different sizes, so be aware that you may need up to a full size larger or smaller depending on the shoe manufacturer. It’s also wise not to purchase an ill-fitting pair with the expectation that you’ll be able to “wear in” the shoes over time. This can lead to getting uncomfortable shoes, which you will seldom end up wearing. It’s much better to just buy shoes that feel comfortable, to begin with. While you may not realize it, your feet can also swell during the day. If you get shoes that fit tightly in the morning, they may become uncomfortable by the end of the day. To remedy that, shop as close to the end of the day as you can, if possible. As mentioned earlier, there’s no making uncomfortable dress shoes fit, no matter how long you force yourself to wear them. It’s a far better idea to make sure you get shoes that are already comfortable, helping to ensure you won’t have to deal with the discomfort, pain, and blisters of a too small or too big shoe. When you try on a pair of dress shoes, take into consideration the toe space. You want to ensure that your toes don’t press up against the front of the shoes at all. If you can feel the front of the shoe with your toes or even toenails, you’re going to need something longer. While this might not seem that important, shoes that aren’t long enough will mean that your toes will get squished up in against the shoe when you’re walking. That’s not going to be comfortable, and will leave your toes achy, blistered or just uncomfortable. If you have the option, try shoes that are half a size larger. It’s likely that this will give you the space you need to be more comfortable. If that isn’t an option, you can try out a full size larger if it’s a shoe you’re very keen on. Just make sure you walk around and that they aren’t too big. Aside from the toe space, there are a number of other aspects that are important to keep in mind when you’re shopping for dress shoes. Firstly, make sure you’re wearing the kind of socks that you would normally wear, to ensure the shoes fit as they would on an everyday basis. Also, make sure to take into consideration the fit when it comes to the width of the shoe. Just like with the toe space in the shoe, you also shouldn’t feel like the shoes fit too tightly on the sides of your feet. They shouldn’t be squeezing, pinching, or uncomfortable in any area. If you find that this is the case, but you have plenty of toe room, you may want to consider finding out if there is a wider shoe in the same size and style available. If not, there are brands out there that cater to wider feet that may be worth looking into. On the opposite side of the spectrum, you don’t want too much space on the sides either; this can indicate that the shoe is too big. It can take some time to find something that offers just the right fit, but it’s going to be all the more worthwhile when you’re wearing them every day. As a side note, also make sure you have enough space in the heel. Otherwise, you can wind up with uncomfortable rubbing or blisters on your heels. Luckily, if the other areas of the shoe fit well, this area isn’t typically a problem. In most cases, going up about half a size can help with situations like this, just like it will with the toe space. The most important thing to remember is to take your time. Try on plenty of shoes, getting a good idea of the fit of each. Don’t let yourself feel rushed into making a decision. Remember that it’s most likely your money that is going to be spent on new dress shoes and your feet that will be in them. A good fit can make all the difference, allowing you to look good and feel comfortable. Don’t settle for shoes that aren’t entirely comfortable just because they may be a little more stylish. Overall, finding good dress shoes doesn’t need to be an extreme hassle. Just make sure you pay attention to the fit and the way the shoe feels. Don’t forget that you may be wearing these shoes for a long time, and you may want to wear them multiple times. It’s important that you get shoes that aren’t going to become a literal pain. If you can, set aside a few hours or even a day to really be thorough with your shoe shopping. Depending on your feet and the styles you find, you might discover that it doesn’t take much time at all, or that you may need more time in order to find your perfect fit. Informative post. I have read the whole article and found it important. Tips are also good. I must try to implement those. Thanks for this great share. I always have a hard time finding enough toe room in dress shoes and it drives me crazy!